Sandwich shop in Croydon, just off the High Street. It's quite small inside, with only three cramped tables for eat-in. The daily queue out the door at lunchtimes might be attributed to its convenient location to the Council office around the corner. Convenience certainly does play a part, but the delicious fresh bread, varied and unique daily specials, and friendly staff are the real reason you'll almost always wait a bit before being served. The queue does move quickly though and it's definitely worth the wait. Along with salads, soups (though not in the summer months), and jacket potatoes, there are two "fillings of the day" (veggie and non); and a selection of breads to choose from: basic sliced white and brown, granary bloomers, focaccia, baguettes, and large baps. A sample of vegetarian selections has included spring onion, veggie sausage and egg mayo photo from Jan 2017; Mexican lime chili (using rice as a base); aubergine, feta and basil with spicy tomato; feta, spinach, sundried tomatoes, and chilli oil photo from Sep 2015 and Greek salad. The coffee is a particular favourite — regular or "gourmet" with flavoured syrups for £2 at the same size as a chain coffee's medium. 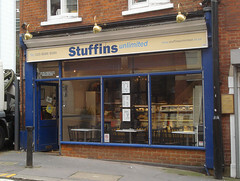 Lunchtime orders can be taken via email to orders@stuffins.co.uk to be received before 11am. Bec visited in September 2017 to sample the one vegan sandwich offering of falafel and houmous on a large white bap (£3.30), though note this appears infrequently on the menu. Daily specials are updated here. They also serve breakfast, cooked in a tiny kitchenette squeezed into a corner behind the counter, including a couple of "breakfast baps". In April 2019, Kake found the vegetarian breakfast bap photo quite disappointing considering the quality of everything else I've had here; the scrambled egg was bland, the grilled peppers were undercooked, and the bottom of the bap was all soggy from the sliced tomato. Bec's verdict: All the excellent sandwich fillings are great with salads and jacket potatoes and the friendly staff make it worth a visit. Kake's verdict: Much more interesting fillings than your average sandwich shop, and reasonably priced too. If you're in the area and want a quick lunch, I'd definitely recommend it — just not that breakfast bap. Last visited by Kake, April 2019. Opening hours verified with the staff, September 2017. Last edited 2019-04-14 15:27:09 (version 15; diff). List all versions. Page last edited 2019-04-14 15:27:09 (version 15).